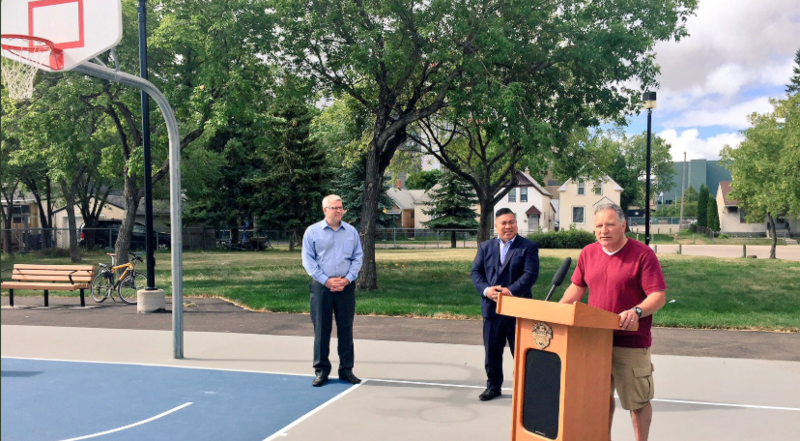 WINNIPEG – Kids near Sister MacNamara Park in Winnipeg have a new basketball court. Councillor Mike Pagtakhan officially opened a new basketball court at Sister MacNamara Park on Ross Avenue. The new court, installed as part of an overall restoration of the park which started in 2017, features new asphalt with court lines, backboards and nets. In addition to a new basketball court, improvements in the park include new fencing, upgraded lighting, site furniture, and site grading, topsoil, and sod. Total cost for these renovations was $130,000 and is being funded from the 2017 and 2018 Parks and Recreation Enhancement Capital Program. On June 28, 2018, the City opened a new spray pad at the nearby Freight House Recreation Centre.